As anyone who watches television or uses the internet already knows too well, the madmen at Taco Bell are currently in the midst of a blitzkrieg-style advertising campaign for its artery-clogging Quesalupa. 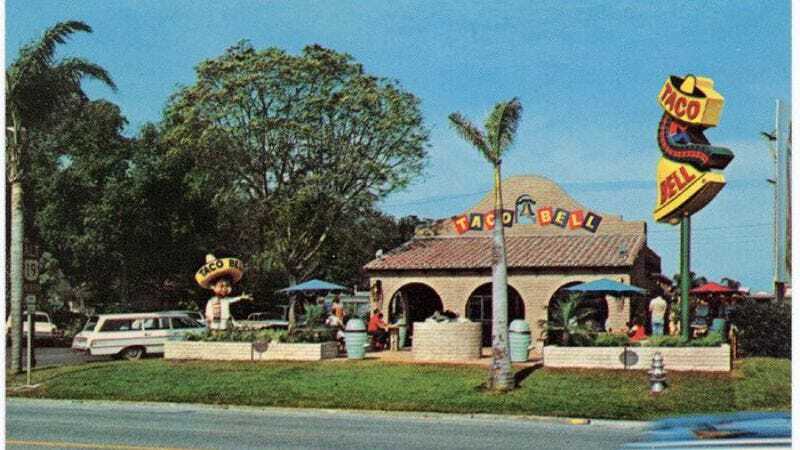 It might be a good time, then, to flash back a few decades to a happier, gentler era of Taco Bell advertising. In particular, a 1979 spot for the fast food chain has resurfaced on YouTube. The commercial proves that Taco Bell may have had one of the most diabolically catchy and memorable fast food jingles of all time: “Put a smile on your face / At Tocka-Tocka-Taco Bell!” Back then, in a hint of Subway ads to come, the Bell was promoting itself as “The Fresh Food Place” during the Jimmy Carter years. The ad is almost blindingly Caucasian in nature. Arguably, the commercial’s most memorable character is a blond-haired jock in a varsity jacket grinning like Patrick Star as he takes his tray of tacos and burritos away from the counter. In a humorous juxtaposition that could have come directly from a Johnny Carson monologue of the era, the Taco Bell ad is followed by a teaser for a news story about gas rationing. The deep-voiced fellow seen here is Mort Crim, the jocular, pun-loving anchorman on Detroit’s WDIV from 1978 to 1997. This would have been fairly early in Crim’s nearly two-decade run in the Motor City. An exemplar of the Ron Burgundy era of journalism, the veteran TV newsman had also worked in Chicago, Philadelphia, and Louisville before arriving at WDIV, an NBC affiliate. He never went national, but his high-profile Detroit gig nevertheless earned him a lasting place in popular culture. In 2003, The White Stripes used Crim’s voice on “Little Acorns,” a track from their Elephant LP.